* So can I create an Excel spreadsheet that connects to SQL Azure, build a report using data from there, upload it to the Excel Web App and then refresh the connection so that my spreadsheet in the cloud displays live data from the cloud? 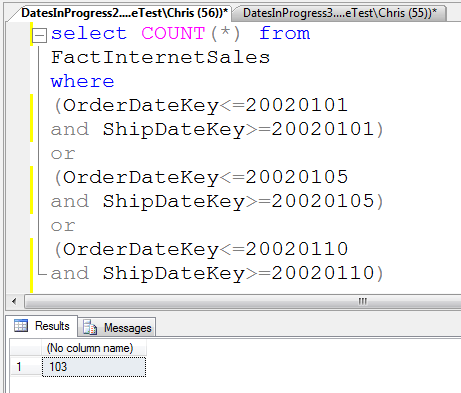 None of the built-in functionality for connecting to SQL Server from Excel 2007 seems to work. 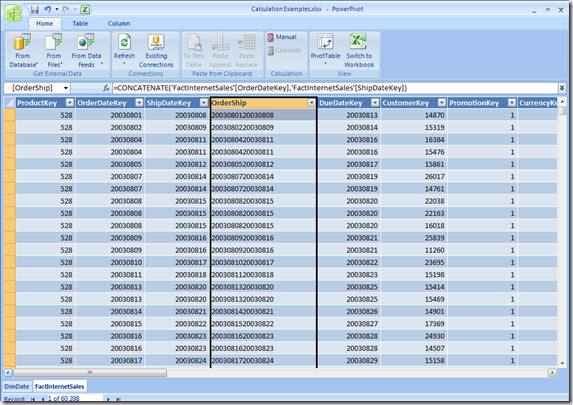 However it is possible to connect to ODBC data sources from Excel and SQL Azure can be exposed as an ODBC data source. 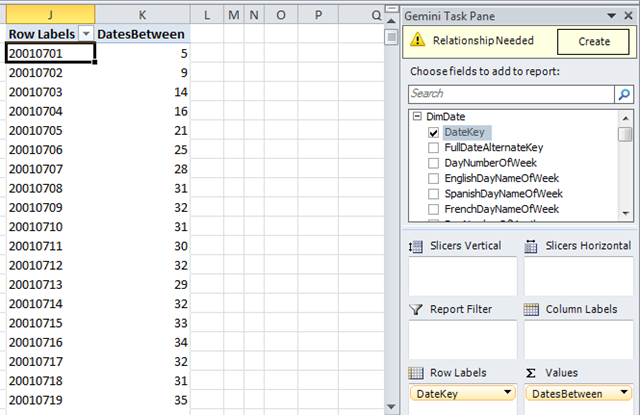 So, in Excel, go to the Data tab and click on the “From Other Data Sources” and “From Data Connection Wizard”. Select the ‘Use Connection String’ option and paste the ODBC connection string that SQL Azure generates for you into the box. Paste the value of the Uid property in the User name box, and put your password in the Password box. Delete the Uid and Pwd properties from the connection string. Finally a list of tables in your SQL Azure database appears; choose one, create an Excel data source and then create either a table or pivot table from the data. Click OK, enter your password one last time, and bingo! Shame – I can understand why it makes sense for most external data connections not to be supported, but in this case, when the external data you’re connecting to is also in the cloud, it would be nice if an exception could be made. One day, though, I’m sure a scenario like this will work. When I think about what Microsoft’s story for cloud BI might be like, the Excel Web App is the obvious candidate for the reporting tool. Whether you’re reporting direct from relational data stored in SQL Azure, or from some kind of cube (PowerPivot in the cloud is another obvious direction), Excel is going to be the easiest way to do it for the largest number of people. I do see a role for some kind of SSRS in the cloud too, but even in the Microsoft BI stack at the moment there’s a lot of overlap between SSRS and Excel/Excel Services for reporting; I wonder if this will be rationalised at some point? 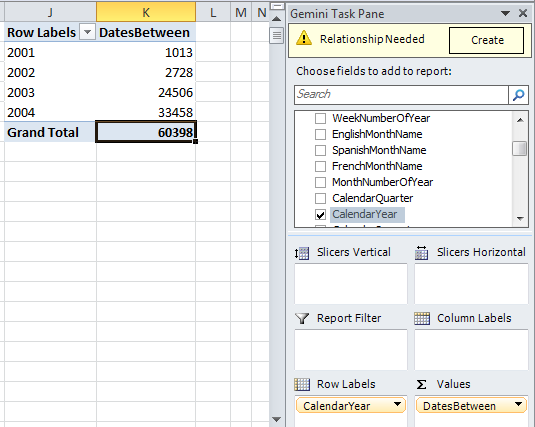 For example Report Builder has never really caught on as a way of letting end-users build their own reports, so why not forget it, develop Excel for this purpose and somehow extend SSRS’s rich functionality for managing and scheduling reports to work with Excel-based reports? Just a thought. #Error CellPermission (3, 162) The member ‘[TEST]’ was not found in the cube when the string, [Measures]. [TEST], was parsed. And in any case, how can you know in advance what the name of the calculated measures you want to grant access to are going to be anyway? This set contains all of the measures, including calculated measures, that have been created on the MDX Script – except those that have their Visible property set to False (these you’d have to add to the set manually). As you can see, we can now see the value for TEST. Of course you also need to be extremely careful you’re not using a security hole here by doing this, test thoroughly and use Read Contingent permissions as appropriate. 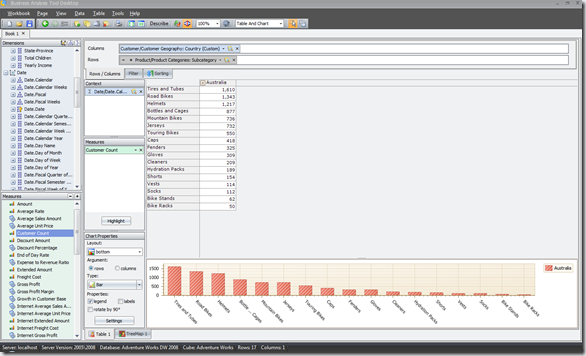 Continuing my occasional series of reviews of SSAS client tools, I recently took a quick look at Business Analysis Tool Desktop from BIT Impulse, a company based in the Ukraine. 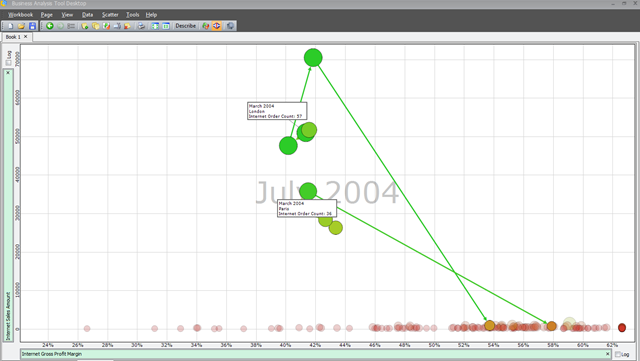 It’s aimed at the power-user market, which Proclarity desktop used to dominate (and still does, to be honest, despite the fact it died several years ago, but I won’t go off on that rant again), and offers advanced analysis functionality for people who find Excel pivot tables too basic and restrictive. It makes a good first impression – a nice, modern UI, with a look-and-feel that will be very familiar to users of Proclarity and also Tableau. To start you need to create a ‘workbook’, which contains multiple ‘pages’, which can contain several different types of analysis. The first page type can contain either a table, a table and a chart, or just a chart. Query building is accomplished by dragging and dropping hierarchies either onto the rows and columns of a pivot table, or onto a ‘shelf’ on the top of the pivot table, and this works very smoothly and intuitively. All of the advanced selection mechanisms you’d expect are present: you can select individual members, entire hierarchies or levels, descendants, and so on. 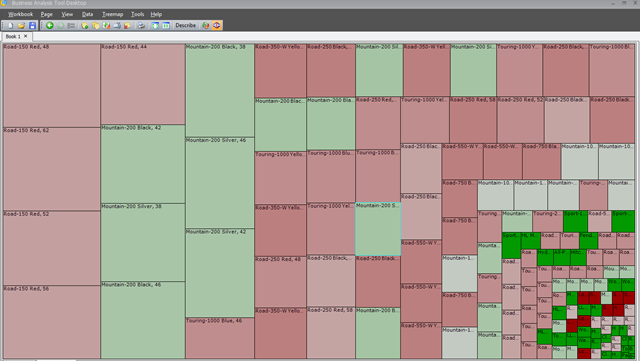 Complex filters of either the Rows or Columns axis, or specific hierarchies that have been selected, can also be built up using one or more conditions; similarly you can sort axes and hierarchies easily too, and do Office 2007-like cell highlighting to create heatmaps. 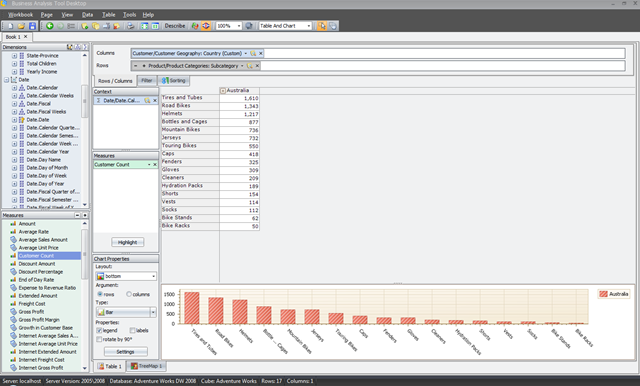 Once the query has been executed, there’s a nice feature whereby you can hide some or all of the real-estate connected to query building such as the lists of dimensions and measures and the ‘shelves’; I also liked the way it was possible to resize rows and columns in the grid to make the layout clearer. Overall, it’s certainly a strong competitor in its sector and worth checking out if you’re in the market for this type of tool – I liked it. I wouldn’t say it was miles better than any of the other tools like it that I’ve reviewed in the last year, but it’s definitely no worse and has its own particular strengths. You may recall that by the end of last week’s post on solving the ‘events in progress’ problem in DAX, I’d managed to get the right values out of PowerPivot at the Date level with good performance. BUT when, for example, I selected a Calendar Year I got no values out, and I hadn’t even thought of how to handle situations such as when Date was on filter and the user had selected three different, non-consecutive dates. Well, that was last week when I was a DAX newbie – this week, well, I’m slightly less of a newbie and I’ve got the solution. First, let’s restate the problem a bit more clearly. 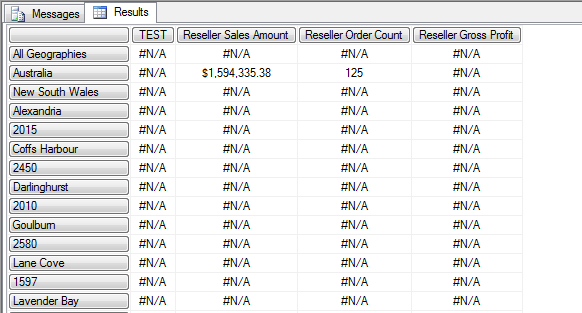 What I want is this: when I have a date on columns or rows, I want my calculated measure to display the number of rows in the FactInternetSales table that have an OrderDate less than or equal to that date, and have a ShipDate that is greater than or equal to that date. This way I see the number of rows in the table where something has been ordered but not yet shipped. When I select a year, I want to see the number of rows where that OrderDate-ShipDate range intersects with the dates in that year. So if I selected the year 2002, I want all the rows where either the OrderDate is in 2002, or the ShipDate is in 2002, or when the OrderDate is before 2002 and the ShipDate is after 2002. 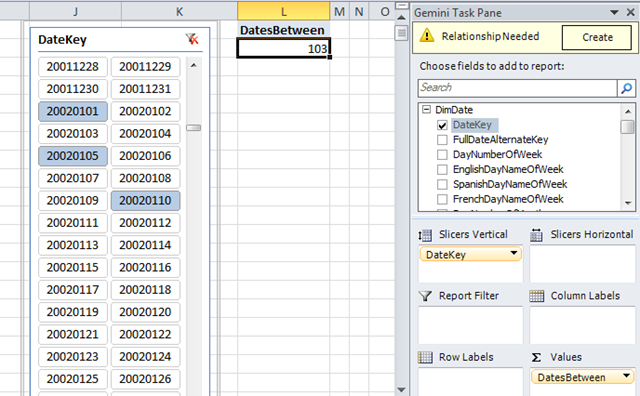 Finally if I make a multiselect when Date is on a filter, for example if I multiselect the 1st January 2002, the 5th of January 2002 and the 10th January 2002, I want to count the number of rows where the OrderDate-ShipDate range includes any of those three dates. 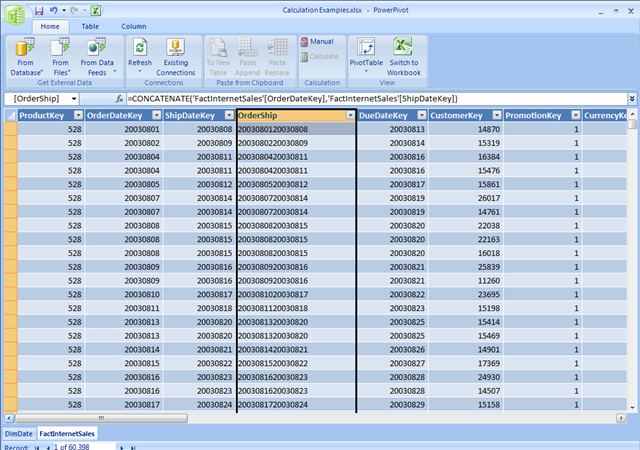 It’s using the Calculate function to evaluate the expression CountRows(FactInternetSales); what it’s trying to do in the outermost filter is to filter all of FactInternetSales, and find all the rows where there is at least one Date in the current selection that is between the OrderDateKey and the ShipDateKey. But, as we learned last week, doing a filter on all the columns in a table is very inefficient, and what we actually want to do is to filter on just the columns we’re interested in: OrderDateKey and ShipDateKey. However what I found was that I really needed all of the distinct combinations of OrderDateKey and ShipDateKey, but I could only get either all of the columns in a table using the table name, or the distinct set of values in a single column using the Values() function. Therefore I couldn’t actually filter on the distinct combinations of OrderDateKey and ShipDateKey where OrderDateKey>=DateKey>=ShipDateKey. This seems like a limitation of DAX from what I can see, though it might turn out that there is a way of doing it – if there is I will of course blog about it. The logic is the same as with the previous expression, with the all-important exception that the outer Filter only works on the distinct values of OrderShip. It works and it’s fast, so I’m relatively happy although I would like to find a more elegant solution. 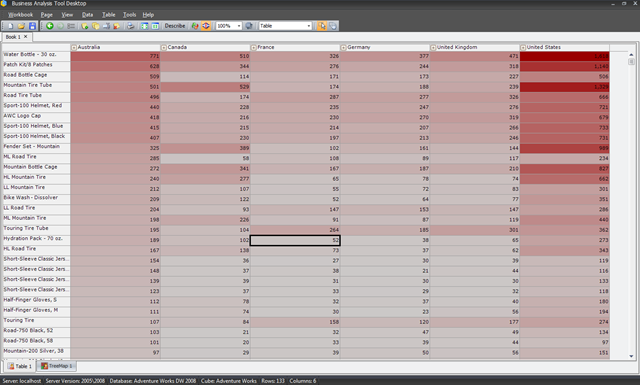 I think this illustrates one area where DAX is superior to MDX. MDX is notoriously bad at handling multiselect, but as Marius explained to me in DAX multiselect support is built-in: the Values() function is rather like a CurrentSet function, returning the set of all selected (‘existing’ in MDX terms) values in a column in a particular context. So, another problem solved… time to think up the next challenge!